O’Keefe pilot on the List. There have been rumours about this for a while…. 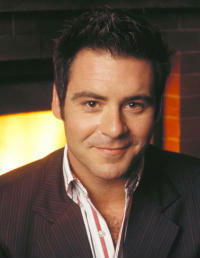 But The Age says Andrew O’Keefe is set to shoot a Tonight-style pilot for the Seven Network. If it goes ahead it would make the host one of the busiest guys around. After all he already has Deal or No Deal, The Rich List and Weekend Sunrise. O’Keefe is an astute performer with a background in law, who studied at the Victorian College of the Arts. But would we swallow his up-front hosting style in a Tonight show? Based on his success rate, you would have to argue that it’s worth a pilot to find out. Meanwhile no more news yet about the Naomi Robson pilot which reportedly went down well at the shoot. Variety is fast becoming the buzz word in TV this year with and Rove, The Nation, The Sideshow and Newstopia. He’s a talentless dimwit, and he’s getting way too much screentime. GET HIM OFF TV!!! At least they won’t need to sweeten the canned laughter like Rove does (ever so subtly)… O’Keefe always laughs at his own jokes anyway. Another arrogant male who has an ego bigger than his talent … just like Eddie … obnoxious. Won’t watch anything he does either!